Channel M is a local TV channel here in Manchester. Every week they broadcast The Lancashire Cricket Show, which is also available online. In this week’s episode, Brad Hodge is interviewed about how he’s leaving for a few weeks in order to go and earn seven boatloads of cash in the IPL. He’s got a face that needs a good shoeing. Someone from my office was interviewed by Channel M this morning – something about Sven Goran Eriksson. No he always sounds miserable. He has been miserable since the day he found out Dean Jones wasn’t his father. A fact that the rest of us would rejoice. His name is very similar to Brad Hogg’s. That’s enough to make anybody miserable. 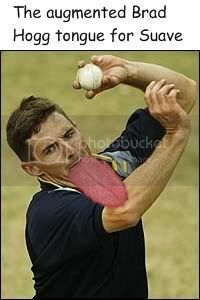 His tongue is less annoying than Hogg’s. Someone had to mention the tongue! Now the nightmares are going to start again, and it’ll be six months in therapy for me! Just for Suave – dream on! That really has made my beer consumption come straight back up! That dameship I mentioned KC, forget it. Send her to the tower! Ceci, that made me throw up a bit in my mouth.